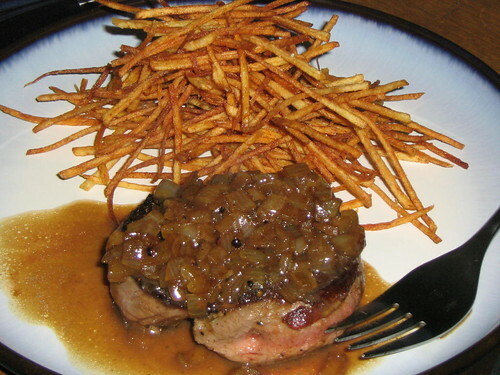 This meal is perfect: a tender cut of beef, a pan sauce made with brandy (my favorite), lots and lots of shallots, and homemade French fries. If you’re familiar with Michael Pollan, you likely know his food philosophy is that you can eat whatever you want, as long as you make it yourself. He points out that if we had to make all of own fries, we probably wouldn’t eat them so often. I mean, have you ever cut up baking potatoes into tiny little matchsticks? A mandoline helps speed up the process, but you still have to deal with heating up the oil to the proper temperature, cooling the oil, then disposing of the oil. And if you lack an exhaust fan that sends those fumes outside (like me), you have a home that smells like oil for about one or two weeks. That said, for special occasions (I confess, these particular pictures were from New Year’s Eve a couple years back), the fries are completely worth it. And since I buy a whole tenderloin and butcher it myself, steak au poivre is served in this home on a regular basis. Add a side of green beans and some brown-braised onions, and you have a meal worthy of celebration. Remove steaks from fridge for 30-45 minutes to allow them to come to room temperature. Pat the steaks dry with paper towels. Sprinkle both sides with salt and pepper, pressing on the coating to adhere. Heat 1 1/2 tablespoons of the butter and the oil in a large saute pan over medium-high heat until the butter almost smokes. Place the steaks in the pan and lower the heat to medium. Cook the steaks for 4 minutes on the first side, then flip over for 3 minutes, for medium rare. Remove the steaks to a serving platter and cover tightly with foil. Pour off all but 1 tablespoon of fat from pan. Add the shallots and cook until starting to brown. Raise heat to high and add broth; reduce by half, scraping up brown bits. 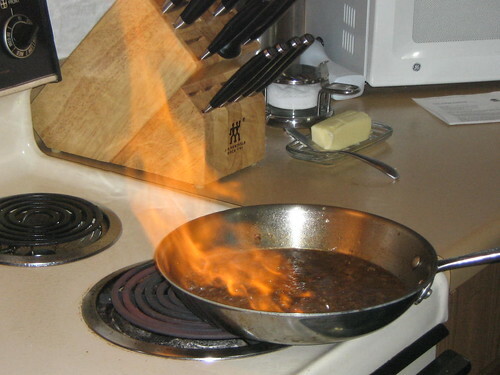 Add brandy and carefully ignite (remove from burner if cooking with gas) to burn off the alcohol. Remove from heat and add remaining butter, adjust seasoning if necessary. Serve the steaks hot with the shallots and sauce on top. *I prefer brandy to Cognac in this recipe. Preheat the oven to 350 degrees F. Pour at least 1-inch of oil into a deep pot and heat it to 350 degrees F.
Slice the potatoes into thin matchsticks (1/8-inch thick) with a vegetable slicer or mandoline, dropping them into a bowl of cold water as you cut. Drain the potatoes and dry them thoroughly with paper towels. Drop the potatoes in batches into the hot oil and cook for 3 to 5 minutes, until golden brown. Remove from the pot with a wire basket skimmer or slotted spoon and drain on paper towels. Place on a baking sheet, sprinkle with salt, and keep warm in the oven while you cook the rest of the potatoes. Sprinkle the potatoes with parsley, if desired, and serve hot. The steak looks wonderful, but it’s those matchstick fries that got my attention! Very nice! It’s making me hungry again. Michelle, I’m not going to lie, these were some of my favorite fries, ever. Ben, I’m glad to have made you hungry again.